Actually this is the main purpose which takes my time so I almost has no time to post (not even have a holiday). This game is my final project for my pre-graduate study. It will be hosted on http://saboteur.arkross.com. For those who haven’t heard of this game, I’ll give you a quick explanation. It’s a mining-themed card game. 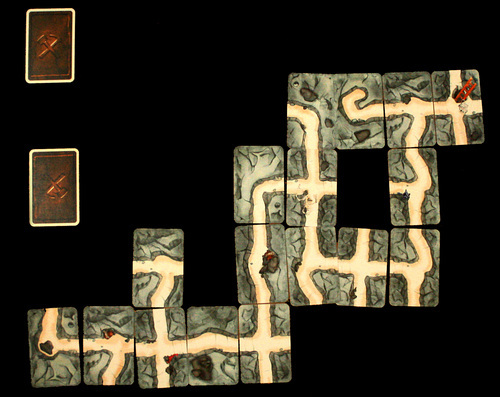 The players make a path at each of their turns, until they find the gold, or until the deck is eaten up. The full guide is here. And my stubbornness leads me to Ajax. An ordinary ajax technique won’t be sufficient, I need Ajax Polling technique. According to my research, the true Ajax Polling is one of the technique which is called Comet Programming. What the hell is that? Well if I know, I would not be so confused doing this project. So far about my project, I’m using CodeIgniter 2.0.2 (and I will continue updating it), jQuery 1.5.2 (always updated), and some CI Libraries. I hosted my project on Github. If you want to check just stop by. Friends – What is it? If you’re using Google (I believe you are), imagine the server is down for some period of time. You’re desperately in need to use it and it’s not running. Do you stop using its services even after it’s up and running again just because it has failed you? If you’re using Yahoo! Messenger Service or MSN Messenger Service, imagine the chat server is down and you can’t chat with your friends. When it’s finally running again, will you hate it because of being down? If you’re subscribing to a ISP and sometimes the network is down, once and twice, you may post your complain. But do you stop subscribing just because of it? Just because you “paid” them and didn’t get what you deserve for a period of time? If you have a laptop and the battery is unusable, having you plug it in at the power source everytime you use it, do you quickly dispose it and buy a new one? Even if you do have money, will you discard it that easily? Ah well, forget those stupid questions above. What I want to say is, even a strong server like Google, YM, MSN Messenger will sometimes go down – whether it’s because of hardware maintenance, software update, or an accident. They dedicated their servers to serve everyone in the world. Imagine how many requests come to the server every second, and how many responses does the server has to send back to the clients. After using their services, I don’t think anyone will hate them just because they’re down for some time. Well, now how about your point of view about your friends? If one of your friends “goes down”, how would you react? Will you look for the reason why he/she “goes down”? Will you still consider he/she as your friend? If you still do, why? Is it because you still need him/her? Is it because no one can replace him/her? If you don’t, why? Is it because you hate him/her deep inside? Is it becase you no longer need him/her? Will you help him/her to back on his/her feet? Or will you just wait and do nothing? I’m not Google, which can handle almost all your requests without fail. I’m just a man with limited capability. Just a spam I guess, but I really want to write it down. Sorry if my writing is so lame. Author AlexanderPosted on November 27, 2010 December 30, 2012 Categories Diary, RandomLeave a comment on Friends – What is it?